SEOUL, Dec. 6 (Yonhap) -- President Moon Jae-in held a meeting Thursday with the chairwoman of Vietnam's National Assembly, Nguyen Thi Kim Ngan, to discuss ways to further enhance the countries' bilateral relationship. The meeting was held at Moon's presidential office Cheong Wa Dae in Seoul. The Vietnamese lawmaker has been on a four-day visit since Tuesday at the invitation of her South Korean counterpart, Moon Hee-sang. While meeting with the chairwoman, President Moon emphasized the importance of Vietnam to South Korea in a variety of fields, ranging from education to investment to personal exchanges. Vietnam is South Korea's largest trading partner in Southeast Asia and its fourth largest in the world, with the countries' two-way trade coming to US$63.9 billion last year. During Moon's visit to Vietnam in March, he and Vietnamese President Tran Dai Quang agreed to boost their bilateral trade to over $100 billion by 2020. 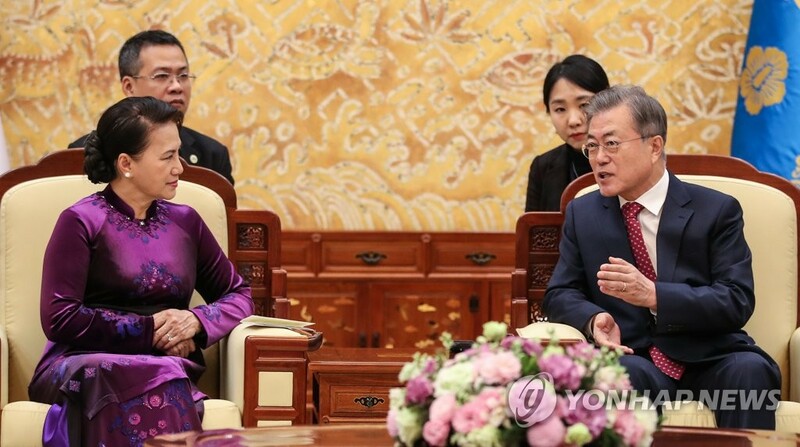 While talking with the chairwoman on Thursday, Moon expressed his satisfaction with the progress the two countries have been making on various issues agreed upon between the two leaders in March. "I think the relationship between the two is very good in every aspect," Moon said, adding that her visit will help strengthen the already strong mutual relations. "There are many Vietnamese people living in Korea, and they are making great contributions to the growth of the Korean economy as well as enriching Korean culture," he said. On her part, the chairwoman vowed to work hard to achieve closer cooperation and better relations between the two.